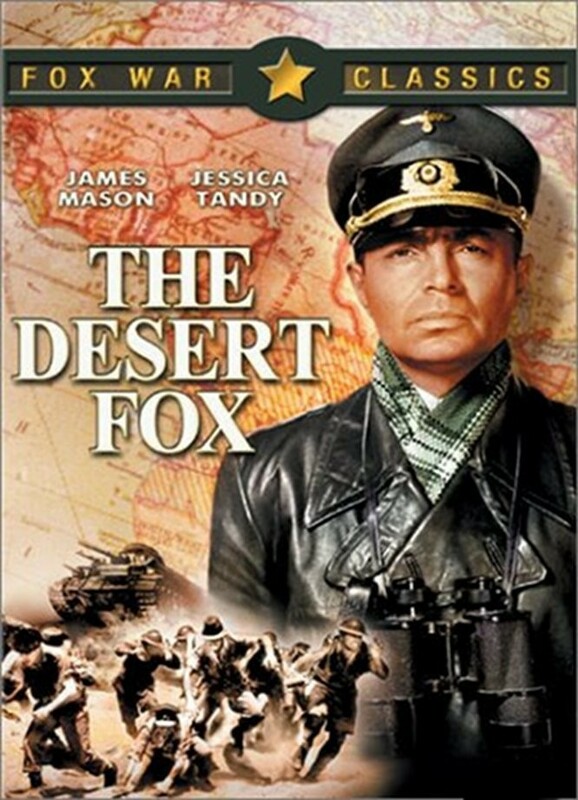 The Desert Fox, starring James Mason as Field Marshal Rommel, is based on the biography of Rommel by Desmond Young. The movie opens with British commandos trying to assassinate Rommel in 1941 and then forwards to 1943 showing Rommel at El Alamein. Rommel, who is of poor health, is just back on the front line and faces a pretty desperate situation. The German troops are far outnumbered and any reasonable commander would give the order to withdraw. Not so Hitler whose consultants all encourage him to give orders to either win or die. For the first time, the movie tells us, Rommel starts to doubt the Führer’s sanity. It will not be the last time. On the very contrary. The movie tries to show a Rommel who goes from doubt to open criticism and even knows the group around von Stauffenberg will attempt to assassinate Hitler. While not tied to the assassination he’s still found guilty of treason and given a chance to either get a fake trial or to commit suicide in order to assure the future of his wife and son. I must admit I expected this movie to be far better than it was. The story is interesting, of course, but the way this was filmed was not much better than a B-movie. Mason is good, I wouldn’t say he’s great but he’s good. There is just one problem. He doesn’t look like Rommel. What didn’t work is that most of the movie is either composed of real footage or scenes filmed in the studio which makes the whole movie look like a theater play broken up by documentary material. The other problem is that we don’t really get to know Rommel. Given that the title of the movie is The Desert Fox and not “Rommel’s Downfall” or some such thing, I expected that we will learn why Rommel was considered to be such a great general. Although he was their enemy, the Allies admired and feared him. The movie only shows us a Rommel who is very realistic, who knows when a battle can’t be won, who makes great suggestions, but isn’t heard. The movie also fals in showing Rommels’ humanity. It seems he was never accused of war crimes. He refused to kill Jewish soldiers, civilians and prisoners. The best part is that the movie shows how Rommel first doubts the people who consult Hitler before he doubts the man himself. Once he’s understood that his Führer is nothing but a maniac, he speaks his mind openly and confronts him. I watched the movie Patton two years ago and thought it was outstanding. If anyone knows of a biopic of Rommel which is equally good, please let me know. I didn’t mind watching The Desert Fox, but it’s certainly not the ultimate movie on Rommel. Rommel’s son Manfred died last month. It’s interesting to know that he formed a friendship with Patton’s and Montgomer’y sons. When Gretchen Rubin started to work on her biography on Winston Churchill, she first read extensively everything that was available. Every biographer would do the same, especially when the person he wants to write about is already dead and the possibility for an interview non-existent. This isn’t really remarkable as such, remarkable is what she came up with after having read so much about Churchill. She realized she couldn’t write the type of biography you would normally write and decided to call her book 4o Ways to Look at Winston Churchill: A Brief Account of a Long Life instead. In her book she names 40 elements of Churchill’s life and has a look at them. She also shows contradictions in naming Churchill’s positive aspects in one chapter followed by the negative ones in the next. For every character trait one biographer came up with, another one named the exact opposite. If you want to really understand Churchill and the range of his complexity you have to take into account all the contradictions as well. Rubin doesn’t say her approach is a definite one (although she used the same approach again in her biography of Kennedy) but it is certainly clever and thought-provoking. The Biopic The Gathering Storm goes a completely different way. It shows Churchill just before WWII, during a very difficult period in his life and focuses on his depression and his marriage. We see a very private Churchill, one that not many got to see. I enjoyed The Gathering Storm a lot but I know it isn’t everybody’s cup of tea. The two actors Vanessa Redgrave and Albert Finney are fantastic. 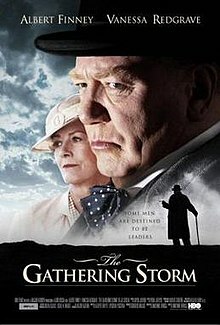 The title of the movie is taken from Churchill’s book on WWII called The Gathering Storm. If you like great acting, are interested in the private side of one of history’s most important men, enjoy character portraits and biopics and a beautifully filmed movie, then you shouldn’t miss this. Unfortunately I couldn’t find a trailer so I posted part one of the movie here. You will notice that Ridley Scott was one of the executive producers.